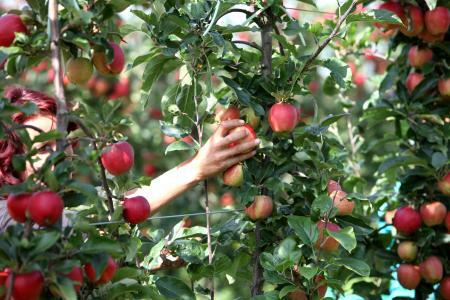 Apple Harvesting & Handling - When all agree, half is free! 'It's got to work for everyone.' That is key at top soft fruit cooperative, Plantsman Producer Organisation, in Ardleigh, Essex. Their members are the first apple growers in the UK to have protective hail netting in their modern trellis orchards and they are equally advanced and focused on all of the equipment they purchase. Yields of 50-60 tonnes per hectare from these intensive orchards compare well with15-20t/ha from the old 'extensive' orchards. So far, Plantsman PO has replaced about one third of its total area with modern, intensive orchards at an investment of £35,000/ha. Under the EU Fresh Fruit & Vegetables Aid Scheme, Plantsman PO has invested in central storage, packing facilities and new orchards with irrigation and hail netting. This has enabled it to be at the forefront of new technologies and innovative horticultural production. As a cooperative1, Plantsman PO is eligible for grant aid from the EU for half the capital cost of approved equipment. This equipment is used on its cooperative grower-members' holdings. So while selection is important, agreement on what is best to use is essential and for that, experience counts. Grower member, Boxford (Suffolk) Farms has been using the same perforated Dolav plastic pallet boxes for 30 years for handling apples from tree to store and for longterm storage. 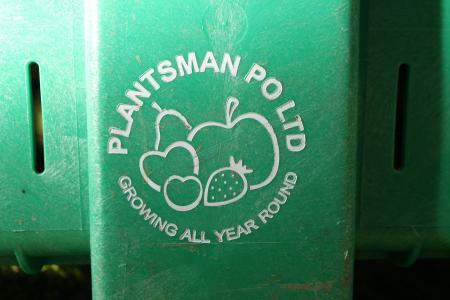 They have lasted so well that Plantsman PO is adding to its existing Dolav box stock by about 1000 each year. 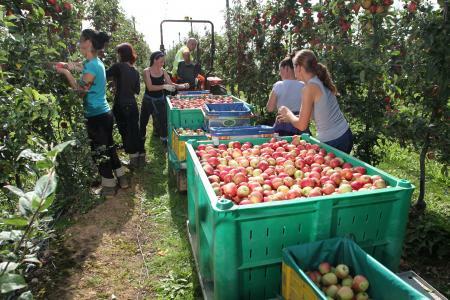 From a total of some 100 hectares of fruit, total tonnage handled in 10,000 bins is some 3500 tonnes of apples annually. Each year an increasing number of new perforated Dolav plastic pallet boxes replace wood as it simply does not last as long. Additionally, the HDPE plastic at end-of-life, after 30 years, can be recycled into other plastic products but wood which last about 5 years, cannot. Plantsman PO sees HDPE as environmentally better. Plantsman PO invests in the latest modern, intensive orchard technology with trellis systems, hail netting and Dolav bins. "The reason we use the Dolav bins is because they are very long lasting, easy to handle, clean and lighter than wood which saves on transport. They help avoid cross-contamination and for storing and stacking they are excellent," said Carmella Meyer, company secretary. Used for picking, transporting and storing the apples for long-term storage, the Dolavs are multi-purpose. "We also see the plastic of the end-of-useful- life Dolavs as recyclable - which is better than wood," Ms Meyer added and continued; "The advantage to Plantsman PO of the Dolav box is that Dolavs' ease of handling allows all of our growers to use them - which is brilliant and we store all members' fruit centrally ahead of it being sold." Plantsman supplies supermarkets including Sainsburys, Morrisons and Aldi as well as the NHS School Fruit & Vegetable Scheme which provides a free piece of fruit to all 4-6-year-old primary school children every day. Until supplied to retail, Plantsman PO stores its fruit 'as harvested' for up to six months in Dolavs in carefully controlled atmosphere stores. "In store we can stack Dolavs higher and more safely than with wooden bins," confirmed Carmella Meyer. Plantsman PO use perforated Dolav Classic plastic pallet boxes of 1200 x 1000 x 740 mm with an internal volume of 600 litres and a tare weight of 37.5Kgs +/_ 500g.